[2011-11-11] Ukraine vs Germany friendly. This game will be broadcast @ ARD Das Erste (satellite Astra & Hotbird - free on air). Who else?`Putting Kroos to be the sole anchor man would be asking for trouble. Also, why the hell is Löw insistent on using the tall and relatively slow and bulky Höwedes in the fullback position. I would certainly love for him to call up Beck, but even without him, Boateng is a FAR better option out wide, especially considering he has a teammate in Müller playing ahead of him. quaazi wrote: Who else?`Putting Kroos to be the sole anchor man would be asking for trouble. I thought wrong. The game will start in 20:45 CET, so in 1 and a half hour from now. tflags wrote: Schürlle for Müller? Whoa, I didn't even notice that. 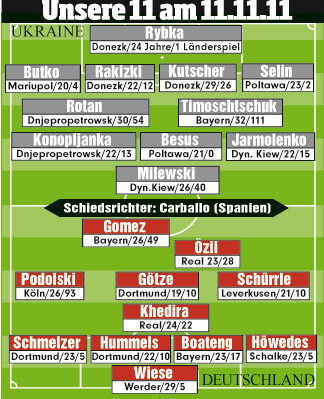 A ludicrous decision while Podolski is still on the field, but... he needs a break, and it would be very difficult for Löw to bench Podolski given his recent form. Why not Neuer in the lineup ?? Is it just for him to get the rest or what?